Here we are in February already and I haven't updated for a while. Life's been busy, hot, stressful sometmes, hot, tiring and so I could go on. Did I mention the heat? It's certainly been nothing like Adelaide and Melbourne, but hot nevertheless. My room faces due west and gets very hot in the late afternoon. The balcony outside gets pretty hot too, far too much to sit there and knit. I have been doing some knitting. I've been practising my lace knitting for Bells' Long Lacy Summer I've done several scarves and bought some lovely lace wool in shades of blue, called Peace from Wired for Fibre. It wound beautifully, no problems at all. The colour in the second picture is a better representation. It is cloudy here this morning, very restful,but the light is poor. The leather lounge is outside on the northern side of the balcony. The glass bricks in the first picture are set into the curved wall with the staircase behind inside. Lots of curvy bits in this Art Deco house. I decided I would make a stole for myself using multiple repeats from a very old pattern. I've been taking my time with this. There have been lots of other things happening here, including moving my mother to a different nursing home closer to my sister. That was unsettling for everyone concerned. As I said, I've done quite a bit of lace this summer, some laceweight, with no problems at all. This wool, pure fine merino, is lovely to knit with. I don't know if it's just my arthritis playing up, or my technique doing something larger, or the humidity which definitely affects the arthritis or what, but my wrists became quite sore and I had to put it aside. So sore that occasionally if I turned my arm, the wrist would really hurt. They are better now, but I didn't want to risk further damage. As I finished breakfast this morning, I picked up the stole and cast off before I could think twice about it. What you see here is the unblocked result. The little points up the edges don't show up here at all. I'm going to block this. I've had a bit of a pull at it both vertically and horizontally and it will open up a lot. Then I'll sew the edges and it will become a cowl or lovely squishy neckwarmer. I've never used scarves and such very much at all till last winter. It's cold here in the mornings, much colder than down on the flat below. It's very chilly walking to the station at 5:30 am. Sometimes it's not really cold enough to have the heating on all day but something is needed around the neck. The house has central gas heating, but takes a while to heat up at the beginning of the season. Last year I was very grateful for the neckwarmers I made and this will add to the choice I have of them. So I reverted to my all time favourite - socks. These will be called Sweetpea socks. She's the small Abyssinian cat which lives here. Why Sweetpea? The colour of this wool is called "Lion's Mane" and it comes from Moggy and Me. Donny's service was wonderful. I emailed the order mid-morning a few weeks before Christmas and the wool was in my letterbox less than 24 hours later. Australia Post did well, but she had to wrap and get it out. I was very pleased with both this and the other lot I bought. It was called teal, very deep, dark, swirly blue/greens. So back to the socks. Sweetpea resembles a tiny lion, similar colour to this wool and a small pointy face. No mane, LOL. The motif is an old Shetland lace pattern called cat's paw. So from a large feline to the tiny one and I have Sweetpea socks. A bit tenuous, but I've seen some odd names and reasons for sock patterns! 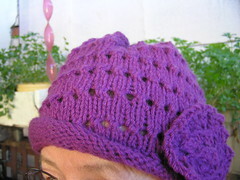 Super simple motif, seven stitches, six rows, no purls because it's knit in the round. What's even better, no pain. 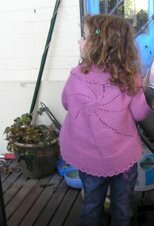 the lace looks great - look forward to seeing it blocked! Like the story of the sweetpea socks - they look great so far!